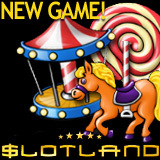 23 July 2012 (London, UK) – Reminiscent of country fairs of days gone by, Slotland.com’s new Carnival no download slots game is cheerful and bright, nostalgically decorated with bumper cars, carousels, candy, donuts and balloons. Its Shooting Gallery bonus game awards free spins, expanding Wilds and bet multipliers. Carnival is a 5 reel, 19 payline game with full-screen graphics that leap off the screen. Like most real money slot games at Slotland, it’s tied to the site-wide progressive jackpot which is currently approaching $150,000. Regulars at Slotland know that when it gets to this level it won’t be long before another jackpot winner is announced. Slotland has some of the most sophisticated slot games anywhere – brilliant graphics and amazing bonus games. Games like Jewels of the Ancients and Pearls of Atlantis raise the bar for online slots design. But sometimes – perhaps especially during the lazy, hazy, crazy days of summer – it’s nice to indulge in some of the simpler pleasures in life. For those with fond memories of small town summer fairs, Slotland presents the new Carnival slot game. Three scatter symbols (a shooting gallery pistol) triggers the bonus round. The reels are replaced with a Shooting Gallery with 6 moving targets. Hitting a target wins one of four bonuses. The “Cash Bonus” multiplies the winning bet. “Free Spins” gives 10 free spins. The “Wild Ride” bonus guarantees that the expanding Wild symbol will appear within the next 10 spins and the “Big Bang” bonus doubles the win. The Slotland progressive jackpot hasn’t been hit since April when there were two major jackpot winners in a row. First Alice M won $180,717 playing the traditional fruitie, Fruitmania. It was re-set to $50,000 and just a couple of weeks later, Alberto S. hit it again winning $68,251 playing one of Slotland’s very first games, Spacejack. Carnival is one of Slotland’s twenty-six one-of-a-kind video slots and video poker games. Several are also available as mobile slots. I just love your site, it’s filled with fresh and relevant articles and have a very nice eye catchy design! Some posts really helped me in my work, so thanks for that! !